Our mission at the NY Surf School is to teach anyone who wants to learn how surf in NYC, not just to surf, but to fall in love with surfing. We at the New York Surf School want to instill good surfing etiquette and a respect for our environment and surroundings. Surfing is more than a sport, it is a lifestyle! We here at the NYC Surf School look forward to teaching you how to surf, and welcome you into the Surfing Life. The NY Surfing Community here in Rockaway Beach is an enthusiastic, positive, upbeat group of people. At the NY Surf School, we have perfected methods of teaching surfing that have been picked up and used at Surf Schools up and down the East Coast, California and Australia. As the longest running Surf School and Surfing Camp in Rockaway Beach, we have become the gold standard that other Surf Schools look to, and incorperate our teaching methods at their surf camps. The formula for success is simple. "Go at your own pace, warm water, sunny beaches, great people in the water and on the beach! The staff at New York Surf School are a truely eclectic bunch of people. We have Ph.d's, Artists, Sculptors, and Actors to name a few. All brought together by our love of the ocean and teaching. Many of our students have been know to hang out with us after class because the good times never end. 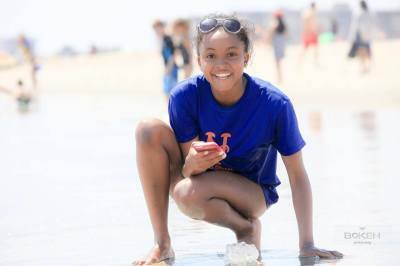 If you are looking for a professional, yet laid back family vibe then New York Surf School is the place for you. Frank Cullen went to HS LaSalle Academy Lower East Side, St. Joseph's College Clinton Hill, Brooklyn Phys. Ed Major. He is a New Yorker. Surfing and living in Rockaway Beach for over 30 years he has surfed every state on the east coast from New York to Florida. 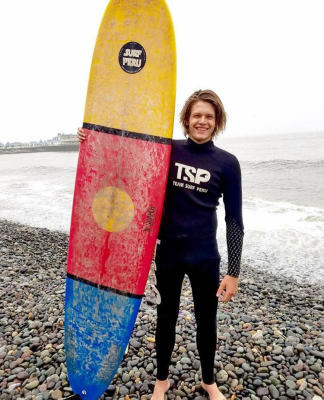 He has also surfed in California, Mexico and Ireland. Teaching surfing for 10+ years, personally taught over 10,000 students to successfully surf. There is no greater joy than watching a student ride a wave for the 1st time. We know that after that 1st ride, life will never be the same!! Born and raised in Rockaway Beach, I'm stoked to have been working as a surf instructor with New York Surf School since 2011. Surfing has enabled me to lead an incredible lifestyle that includes lots of traveling, happiness, and healthy living. Being a surf instructor has opened my eyes to the unique diversity of the NYC surf culture, and has introduced me to many great people. My life revolves around being in the water as much as possible, finding the best waves, and sharing the stoke with other surfers- veteran and novice alike. Daniel is Colombian born and joins New York Surf School by way of St. Petersburg, Florida. As a true Pisces he has always had a natural affinity for the water, growing up near the pristine waters of the Gulf of Mexico, where he spent as much of his life as possible - surfing, wake-boarding, knee-boarding, fishing, boating and swimming! He recalls being captivated at a young age by local surfers braving the hurricane-strength waves and saying to himself, “I want to learn that one day." He and his friends were soon emulating those veteran surfers on second-hand boards, learning how to stay safe in much rougher waters than swimming pools! He has spent years working in music, fashion and marketing, but was determined to stay with his greatest aquatic passions, and teach the lessons of the pool and the ocean to a new generation. Kwame LOVES water and life and is usually found throwing himself headfirst into the ocean or doing a handstand on the sand. Also the schools' yoga teacher he has come to realise that the ocean is the greatest teacher and can’t wait to share his love and knowledge of it with anyone who’ll listen. LIfe is too short for bad vibes! Learning to surf at age 13, she’s always loved the ocean. Autumn's experience with young children is apparent in her natural ability to both have fun with the kids, yet also to teach them the skills necessary to be safe in the ocean. Autumn is currently a student at The Pratt Institue in New York. 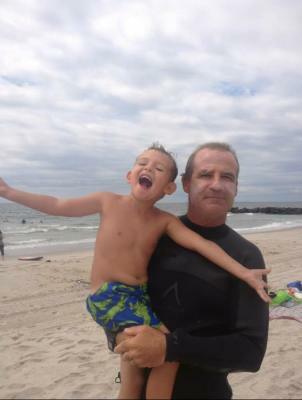 Greg started surfing when he was 13 on Rockaway Beach and has not looked back since. Completely at home in the water, he currently plays water polo for Arizona State University and he teaches people with ease and is always focused on a safe, fun, and educational experience for everyone.